His shirt was untucked, his eyes, rolling, and his tie was tied around his head instead of his neck. Everyone was embarrassed. And no one wanted to get back on the dance floor. When planning your Maine wedding reception, think about how you want to handle alcohol. As a DJ, I have a lot of experience dealing with highly uncomfortable situations at wedding receptions with out-of-control guests under the influence. DJ Mark Sawyer offers helpful wedding planning tools for Maine couples. 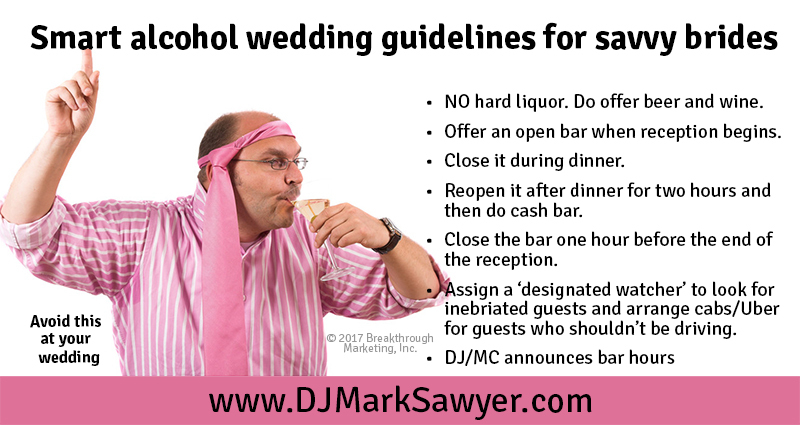 Let us know what alcohol guidelines you’d like for your reception in the “other information” section of the wedding planning form. Be intentional. The purpose of today’s blogpost is to help you to be proactive in your planning efforts. Was this blogpost helpful? Be sure to share it with your friends.